I’m going back to Droid. I loved my iPhone, but I’ve had it after this last update. I’m going back to Droid, just as soon as I possibly can. I have an iPhone 6S Plus. Up until now, I’ve been quite happy with my phone. I was one of those iPhone users who loved the product. In fact, I saw no need to go to the next version when 7 came out (especially since they saw no need to include a headphone jack). I’ve been using an iPhone since about 2011 and I’ve had no complaints … until now. Apple recently released the 10.0.2 software upgrade. I had no desire to install this update; at least, not immediately. I wanted to read about it, see if there were any bugs … you know, approach it with the usual caution we always take with an update to our hardware. So I kept saying “No”, and postponing the update. I know for a fact I never accepted the update, nor did I hit the wrong option and tell it to install. Saturday night I left my phone on the charger. It was also connected to wi-fi, of course. I checked my emails, and, of course, I received the prompt to update my phone (again). I told it no (again). I put the phone down and decided to get some sleep. I’ve installed updates I didn’t like before, and I’ve adapted. I couldn’t work with this one. The features of the phone were not user friendly or intuitive. Some features were no longer available; some had been moved and were difficult to find. The battery life drastically lowered, overnight. Oh, and let’s not forget – I didn’t choose to install it in the first place. Of course, Apple doesn’t have a “rollback” feature on their updates. You can backup your phone to iCloud all day, but even when you restore your backups, it’s on the new version of the iOS. Everything about the new update just made me want to rage scream and smash my phone. But I knew I was stuck with it. Getting a new phone isn’t in the budget right now and even if it was, I shouldn’t have to do this, goddamnit!! I didn’t ask for the goddamn upgrade!!! After a lengthy search online, I did find a jailbreak to kinda’ get my phone back to where it was. The problem was, I lost about half my apps, and some of my calendar data. This, of course, wasn’t a supported solution. Apple wasn’t going to help me with this, so I didn’t bother. I did; however, bother to call them and give them an earful about the goddamn upgrade. I actually got sent to someone who does their customer recovery and takes product feedback. I told him the only little silver lining in this mess is that I don’t have the iPhone 7. At least my phone has a headphone jack. 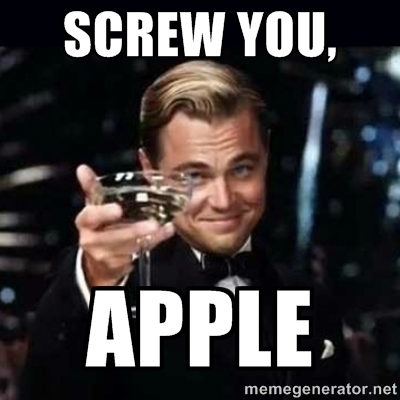 Apple – I never said “Yes”. I never gave my consent. You forced your crappy update on my phone and there’s nothing I can do about it. Oh… but I can. I can tell everyone who asks me if I’m happy with my iPhone just what I think.